On the 11th May 2017, we were pleased to hold SGM’s second ever graduation party. The aim of this party was to celebrate the hard work of all our students for completing the next level of their English studies, to reward students for their hard work in other activities at the school such as in reading, and to have a little fun altogether! 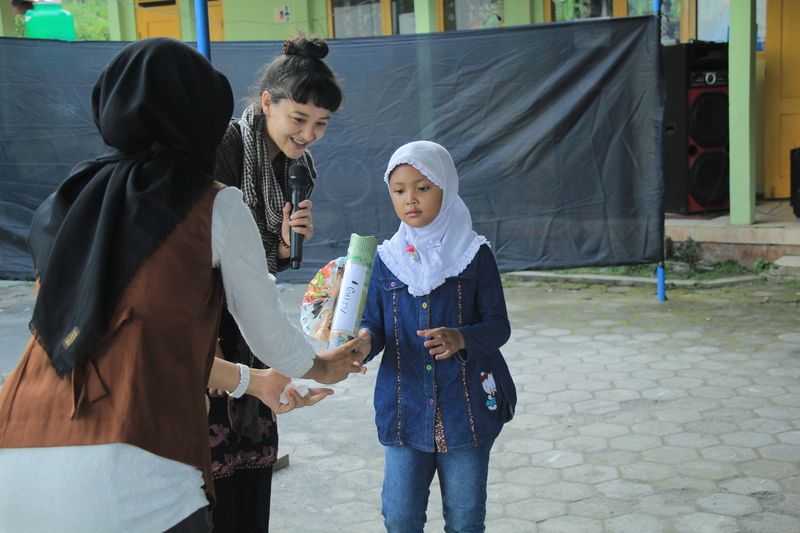 Since the multi-talented dance teachers Mbak Endah dan Mas Abi joined our team earlier this year, the party was also an opportunity to display the hard work of all our dance students and to involve the parents of our students to share in all the joy. 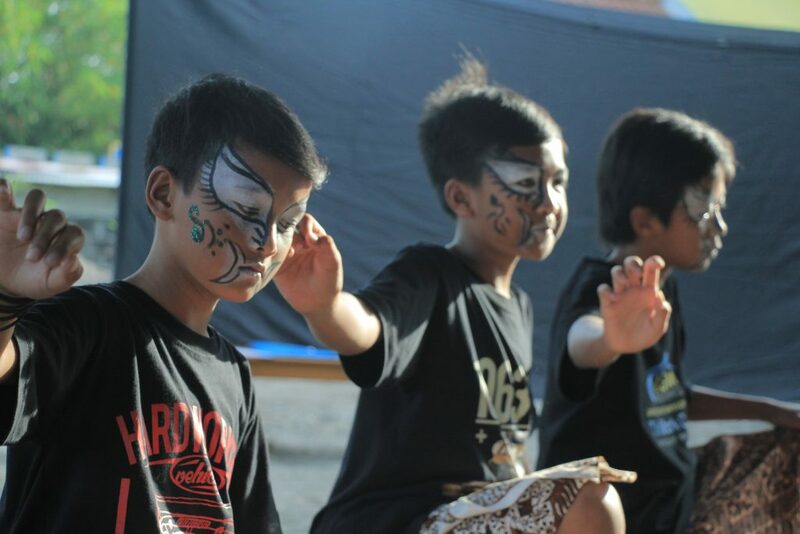 At Sekolah Gunung Merapi, we believe that creative extra-curricular activities such as music, art and dance are essential to develop self-confidence and discipline, and have a positive impact on all other parts of a child’s education. Merapi has an extremely strong culture of dance, particularly of the Jatilan dance, in which dancers are believed to become possessed by wild spirits and will often demonstrate super-human acts of strength. As these trances can be very dangerous, this dance is not taught to children and rarely to women. 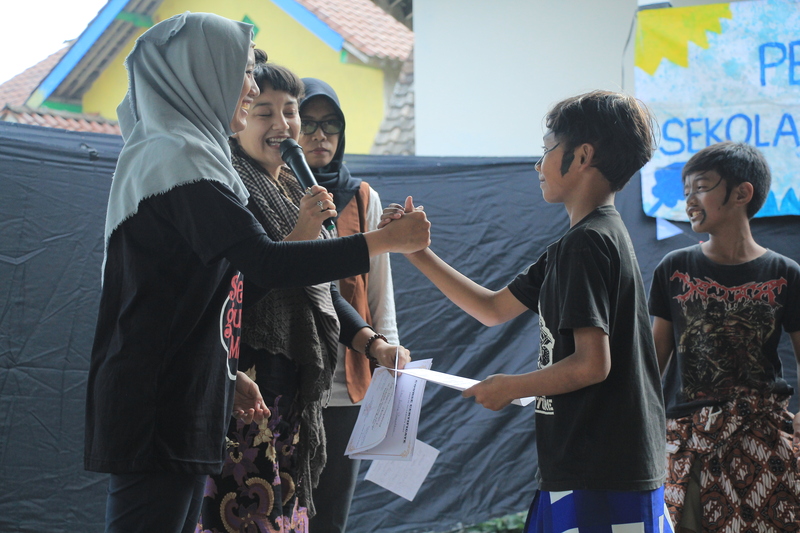 Thanks to the hard work of our dance teachers and professional dance students Mbak Endah and Mas Abi, any of our students are now free to learn dance regardless of their age or gender. 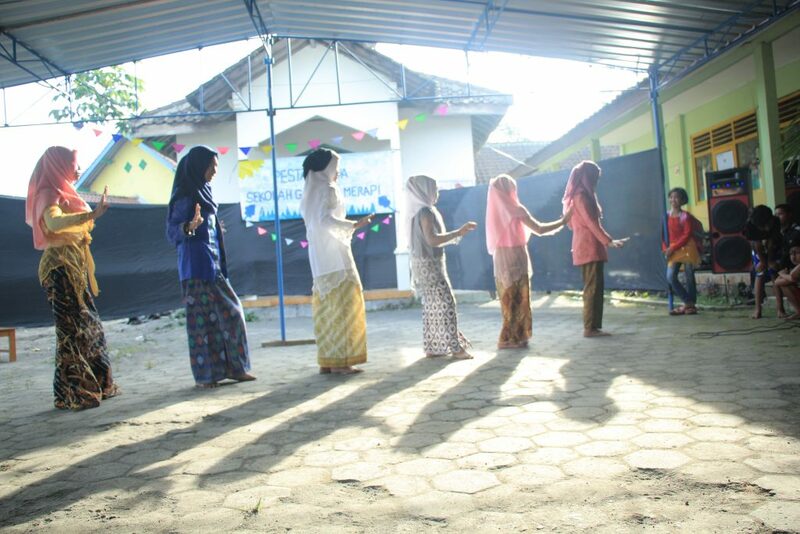 During the school party, four dance groups performed their dances. Two dances were based on the concept of combining the local traditional Jatilan dance with contemporary elements (‘Jatil Hip-Hop’ and ‘Jatil Cilik’), with the two following groups based on a journey through other dance cultures of Indonesia (‘Indonesia Menari’ and ‘Nusantara’). Special awards were given to the most enthusiastic and talented dancers of each group which is a special opportunity to give recognition to students who perhaps are less academic but that excel in creative activities. Due to Merapi’s continued popularity with both domestic and international tourists, we are committed to providing high quality language lessons in international languages so that in future the local community will be well equipped to become innovative leaders in the local tourism industry. To increase motivation, language learning at SGM is broken into levels which take around four months to complete. As part of the awards and graduation ceremony, all students gained a certificate for completing over 50% of the course and special awards were presented to students with high levels of attendance and enthusiasm. Across Indonesia, its isolated, rural areas are characterised with lower literacy rates and educational attainment levels. One way we hope to combat this is by encouraging and integrating a culture of reading among children from a young age. Making our school library into a place that young people want to hang out in is a key achievement but to make sure we continue to encourage and celebrate young students who are reading regularly, we awarded three prizes to the library’s top young users. The winners from this term are: Adit aged 7, for reading 25 books; Nur Aziza aged 8, for reading 35 books; Ning aged 8, for reading a whopping 75 books! A party wouldn’t be complete without a few party games! To reward all the students and families for coming and for all their hard work we prepared a marvellous range of treats as well as the legendary party game of ‘pass-the-parcel’ – here’s some of the kids and volunteers trying to get their head around (and hands-on) this classic party game. 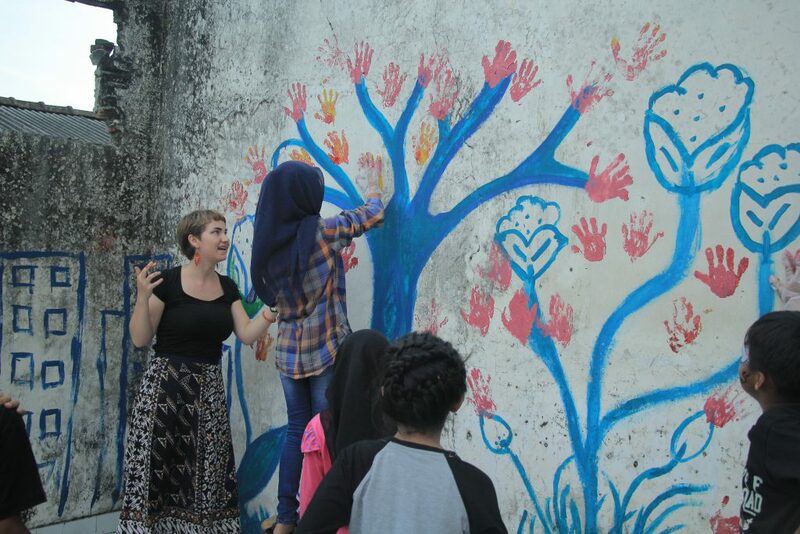 To continue our efforts to restore and renovate the whole of the old Pangukrejo primary school and as a symbol of school unity and our combined creativity, our wonderful art teacher Ms Aylja led us in a group mural based on the theme of growth, inspired by Merapi’s beautiful and ever-changing landscape. Freedom to express: our art teacher guides our young students through a collaborative art piece. Thank you so much to all the students, parents and SGM volunteers for coming together to make the party such an amazing success. We all had an amazing time and already looking forward to the next school party. 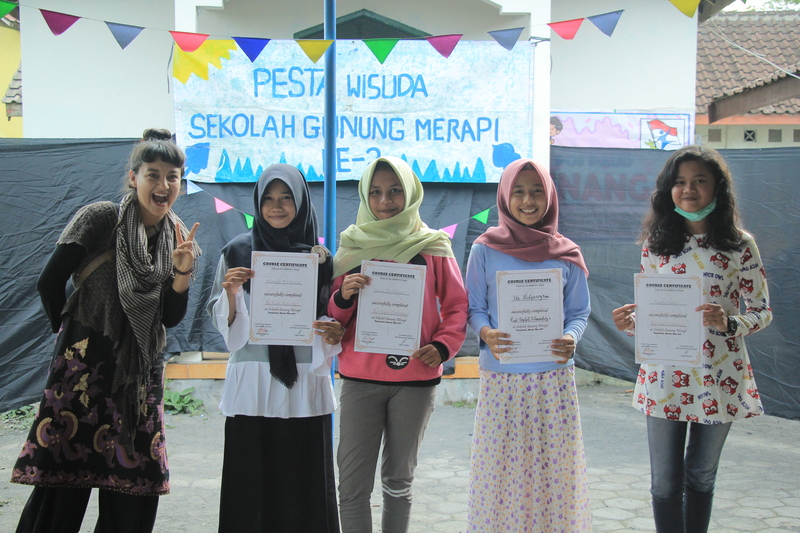 ← Sekolah Gunung Merapi makes the news! What’s new? 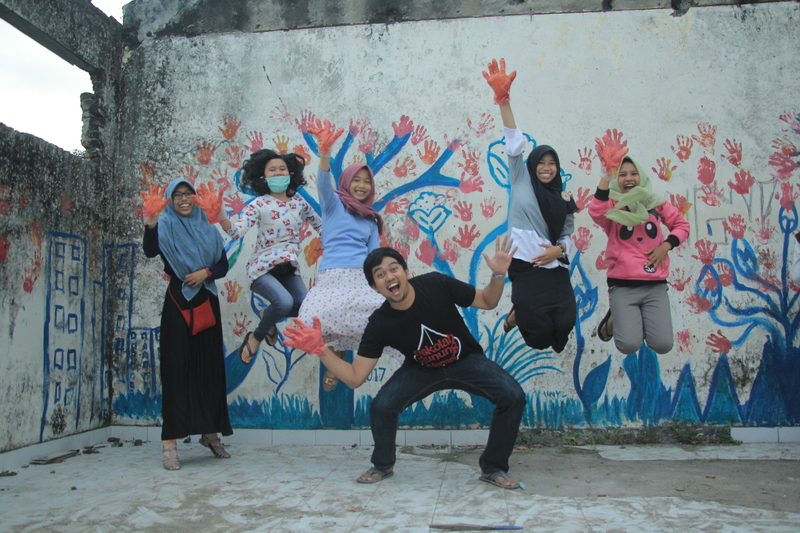 Mitigation education, creativity and music from Merapi. School renovations: finished at last!